Wharton's Ian MacMillan, NYU's Martin Ihrig and Adobe's Jill Steinhour discuss their paper on knowledge-mapping. Companies in almost every industry these days are trying to go digital. When digitalization is done in the context of a company’s strategic knowledge, powerful growth opportunities can be uncovered. One way to do it is by using a strategic knowledge-mapping framework that Ian MacMillan and Martin Ihrig had discussed in a Knowledge@Wharton interview in 2015. In this paper, co-authored with Jill Steinhour, Ihrig and MacMillan explain how the knowledge-mapping framework can shed light on recent strategic changes at Adobe, a software firm headquartered in San Jose, Calif.
Ihrig is a clinical professor and associate dean at New York University, an adjunct professor at Wharton, and the president of I-Space Institute. Steinhour is Adobe’s director of industry strategy and marketing for high tech and B2B. MacMillan is a management professor at Wharton. Firms are investing millions to digitalize their businesses, hoping for a digital transformation that will result in increased revenue, cost reduction, improved customer satisfaction and enhanced differentiation, and ultimately mitigation of the risk of digital disruption. However, going digital is more than big data – simply capturing and analyzing large data troves in isolation leaves a lot of strategic opportunities on the table. When digitalization is done in the context of your company’s strategic knowledge, powerful growth opportunities can be uncovered. The use of the digital data needs to be guided by deep insight into the company’s critical knowledge assets: its core competencies, intellectual property rights, market and industry comprehension, and customer understanding and expectations. Strategic knowledge mapping helps to uncover these critical knowledge assets, providing the context for discovering the most promising digitalization strategies. It helps to identify those knowledge assets that digital transformation can leverage, or illuminates gaps in an organization’s knowledge network. A knowledge map features two dimensions: the structure of knowledge (how codified is an asset, ranging from deeply tacit to highly codified) and the diffusion of knowledge (how many parties have access to it). Digitalization structures knowledge (moving it up the knowledge map), which then makes it possible to develop strategies to share this knowledge and thereby create and capture value from this knowledge diffusion (systematically moving it to the right of the map). Recognized and deployed insights created by data science and diffused it to current and future customers to earn and capture value for the firm. As described in Harvard Business School’s case study Reinventing Adobe, Adobe’s CEO Shantanu Narayen and his senior executives set a strategic goal of expanding and transforming Adobe’s business through a multi-pronged approach of growing organically within the company’s existing business; acquiring companies with strengths in adjacent categories; and shifting the business to allow Adobe to move beyond the company’s desktop heritage while building a predictable revenue stream through subscription-based offerings. The executive team saw significant headwinds for the creative business, which included the company’s flagship Creative Suite software products. Existing customers of Creative Suite (creatives) were largely satisfied with the capabilities of the versions of Creative Suite they had purchased and were not motivated to upgrade to newer versions, which had a premium price tag. At the same time, the growth of new customers was anemic. Younger creatives, an important source of new growth, were especially challenged to pay the price for the software and their needs were evolving rapidly. They were increasingly mobile, wanting connected workflows, faster innovation and more value. Yet, the perpetual-license model of software development limited the company’s ability to deliver innovation to just once every 18 to 24 months, making it tough to keep pace with the evolving needs. Senior strategists at Adobe did an analysis and found most new software companies were being founded with a cloud-based subscription model, and companies with high recurring revenue weathered the financial storm of 2008-2009 much better than those without. Adobe brought together internal subject matter experts in pricing and software sales and strategy to pilot a subscription-based pricing model for its Creative Suite software in Australia in March 2008. Tacit knowledge (figure 1, lower left quadrant) in the form of deep employee expertise about pricing, product value, and customer behavior were cultivated through the pilot project and formed the basis of the knowledge needed to support a subscription model. Learnings were institutionalized (moving from lower left quadrant to upper left, figure 1) and led to the announcement in April of 2012 of Creative Cloud, a subscription based cloud offering of Adobe’s creative software. The 2008 experiment had demonstrated that a new subscription model could attract new users and increase the pace of upgrades by lowering the barrier to entry. But to attract a broader customer base required the Creative Cloud to provide on-going service value in the cloud, mobile apps, and regular product updates throughout the year. “The subscription model allowed us to think differently about our business. It enabled us to bring new value to customers and innovate whenever and wherever it made sense,” said Dan Cohen, vice president, Digital Media Strategy, formerly the head of Corporate Strategy. Based on customers’ changing needs and seeing entire industries shift to the new “always on” paradigm, executives were confident that a shift to a Cloud/subscription model made sense for the business. While changes were underway in the creative business, Adobe also pursued a growth strategy targeting the enterprise software market. Narayen and his leadership team were serious about moving into a significantly different market space. This required a “DNA shift” and the acquisition of new strategic knowledge assets. In 2009, Adobe bought Omniture, an online marketing and web analytics company whose offerings were entirely cloud based. Adobe executives saw a compelling value: by combining “art” as driven by its industry-leading creative software and the “science” gained through Omniture’s industry-leading web analytics, Adobe could address the emerging needs of marketers – a fast growing and underserved market. While some analysts were initially skeptical of the acquisition, customers understood the value of combining content and data to optimize marketing performance online. In addition to this unique value proposition, Omniture’s software-as-a-service (SaaS) business model involved selling and marketing directly to corporations and provided great insight into how to develop a direct, enterprise go-to-market business – a contrast to Adobe’s business selling to individual creatives through resellers and Adobe.com. Key to the successful integration of the Omniture business, Adobe embraced Omniture’s business model and culture, deliberately treating it as a strategic learning opportunity. 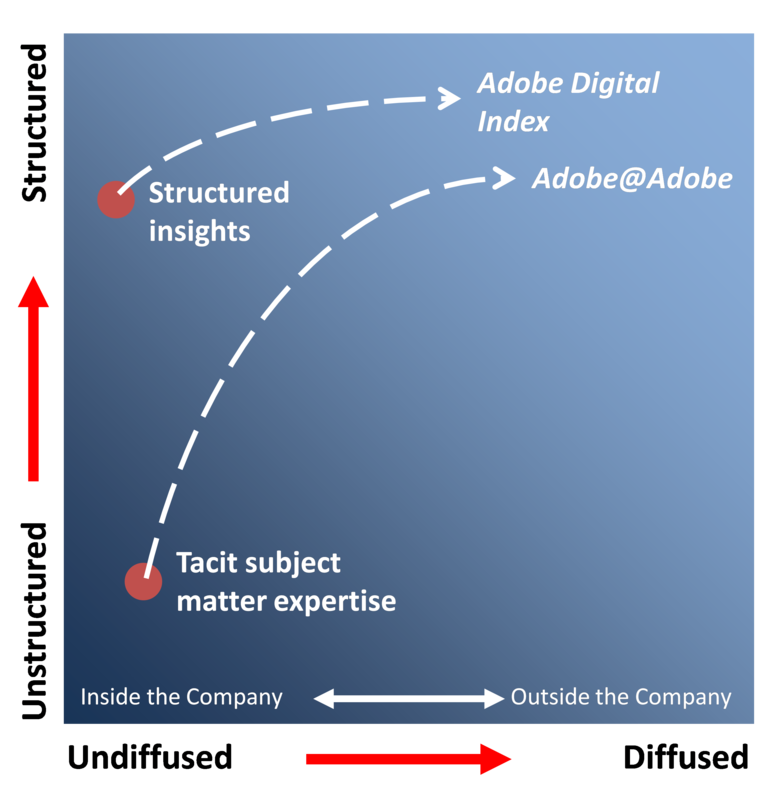 In particular, the Adobe team systematically captured and developed the tacit knowledge of the marketing and sales experts from Omniture (figure 1, from lower right to lower left quadrant). Adobe did not simply buy customers and revenue; it recognized Omniture as a leader and worked to retain the firm’s expertise, seeing it as a critical component of long-term success. At that time, the whole notion of helping digital marketers drive performance through the use of marketing measurement was nascent. The Omniture acquisition helped Adobe extend its leadership status beyond the “creative/Photoshop company” to being widely acknowledged today as the leader in Digital Marketing by industry analyst organizations like Forrester, Gartner and IDG. While it would be inaccurate to say that the acquisition of Omniture precipitated Adobe’s move to the Cloud, the acquisition did bring knowledge and expertise that added tremendous value to the transformation of the creative business. Adobe’s proficiency in acquisition integration also played an important role. The company had a strong track record of retaining talent post-acquisition and, in this case, gave Omniture employees latitude and autonomy while leveraging embedded tacit knowledge. Learning and knowledge diffusion was achieved by accepting and supporting the newly acquired talent and processes. By carrying out this transition quickly and integrating the knowledge, Adobe gained significant market share and differentiation. The practice of packaging up proprietary (undiffused) knowledge and making it widely available outside of the company (diffused) is a recurring theme in Adobe’s history, and is a marked characteristic of other digital leaders, such as Google with its Android platform. The purposeful diffusion strategy behind Adobe PDFs and the free distribution of the Adobe Reader are examples, but the strategy of sharing proprietary information, in particular the movement from the lower left quadrant of the map (tacit undiffused knowledge) to the upper right (explicit diffused knowledge), was a mechanism used more recently by Adobe, but with a very different objective. One of Adobe’s goals was to become the leading digital marketing technology vendor (offering a full spectrum of digital marketing technology) and rapidly build significant market share. However, most customers associated Adobe with Acrobat and Photoshop and there was little awareness of its digital marketing business. Meantime, entrenched competitors with deep pockets, such as IBM, Google and Oracle, were also expanding their digital marketing technology offerings, which could potentially threaten Adobe’s ability to achieve its desired market share. Adobe’s CMO Ann Lewnes was a champion of digital marketing practices, foreseeing the shift from traditional marketing practices to digital – a move that most marketing organizations are now fully embracing. While Adobe’s marketing organization had already been using Omniture’s products to measure consumer behavior on Adobe.com, the acquisition accelerated the process of transferring the tacit marketing analytics knowledge from the Omniture team to the broader Adobe organization. Under Lewnes’ direction, marketing made moves to digitalize the business by reallocating the lion’s share of advertising dollars to digital domains (such as display ads, social and search), while the IT organization helped replatform Adobe’s websites around the world so that marketing could measure the impact of the digital spend. Marketing and IT could be thought of as flip sides of the coin that helped move the company toward its own transformation. Both were internal clients of Adobe software: using web content management and marketing analytics and measurement technology. The use of the digital data needs to be guided by deep insight into the company’s critical knowledge assets: its core competencies, intellectual property rights, market and industry comprehension, and customer understanding and expectations. Adobe Marketing and IT were, essentially, “Customer Zero” – developing internal competencies in technology implementation, marketing operations, digital marketing, organizational design, and the quantification of the contributions stemming from the use of these Adobe digital marketing solutions. This was of significant interest to customers, who were challenged to undertake the same digital transformation themselves. Adobe’s sharing of this knowledge with external audiences was, at first, ad-hoc and opportunistic. However, they soon realized that codifying this internal knowledge and disseminating it publically (movement from the lower left to the upper right of the map) would provide a boost to Adobe’s credibility, and increase awareness of Adobe’s offerings. The Marketing team became evangelists, sharing best practices, speaking at conferences and advising companies and marketing organizations as they struggled to make the shift to digital. This mainly focused on “people, processes and technologies.” They codified their learnings in on-demand videos to help scale the reach of this learning content. In parallel, on the IT side, Adobe formed the Adobe@Adobe team to evangelize the use of Adobe technology to address marketing use cases. Ron Nagy, Sr. Evangelist Adobe@Adobe, develops use case narratives through collaboration with customers, internal practitioners, product marketers and technologists. He’s a firm believer in having a team that can articulate how Adobe solutions address common customer challenges, as well as the more aspirational visionary scenarios. These stories are curated from both internal and external sources and systematically evolve over time. A key input to the Adobe@Adobe efforts is Adobe’s internal marketing technology forum which brings together marketing, IT, product marketing and engineering teams for several days to evaluate and discuss topics that are selected via an internal voting process. This internal forum invites constructive conversations where internal users of the products share best practices and articulate areas for improvement. Product marketing and engineering discuss future products and the evolution of existing products. This forum is a key input to the narratives that Nagy and the team leverage and at the same time, it is an institutional function that allows marketing practitioners to resolve product usage challenges through sharing of best practices, later providing feedback into product teams to optimize the development roadmap and to inspire new product development. Capturing and sharing the knowledge of Adobe practitioners, who possess deep operational knowledge, is also a critical aspect of the program. However, Nagy notes that some translation of that message is needed: “If you are starting a program – there have to be individuals with knowledge of the tech, what is possible, and the business. You need to take the input from practitioners and other sources then do the translation to what is relevant to the marketplace.” These Adobe@Adobe use cases are shared broadly to internal and external audiences. While the program aggregates and curates the knowledge of Adobe practitioners, it does not remove subject-matter experts from the process. Rather, developing the voice of the practitioner is also a focus of the program: those practitioners with interest and aptitude are frequent presenters at both internal and external events representing the practitioner point of view. Note that the Adobe@Adobe team is part of the IT organization, not part of sales; this deliberate separation, to bring an objective perspective. However, the marketing department, ecommerce department and the business unit are also documenting their processes sharing their own unique learnings with the industry. Surfacing ones’ internal best practices or showcasing another organizations’ digital transformation can serve to guide a firm’s own transformation. By capturing and organizing tacit knowledge (the confluence of technical and product knowledge, fueled by employee knowledge and enthusiasm, and guided to relevance by market needs) and then orchestrating the diffusion of that knowledge, Adobe has developed a masterful customer engagement and capability demonstration “machine” that goes well beyond the traditional marketing approach. Adobe Digital Index (ADI) is yet another example of how Adobe has deliberately diffused proprietary knowledge assets into the public domain, in the process creating value for Adobe and customers alike. Knowledge in this case, are the insights derived from codifying an aggregate view of billions of digital data inputs (structured upper left quadrant of the knowledge map) from which the ADI team identifies emerging digital trends or forecasts future events. These are then shared broadly to external audiences. For example, for the past two years, the Adobe Digital Index predicts which movies will be blockbusters, based on the analysis of commentary in social media. The accuracy of their predictions (36 of 37 predictions were spot on) resulted in a call from an executive from a major motion picture distributor who was keen to produce similar predictions. “This is exactly what we hope to achieve” commented Tamara Gaffney, Director and Principal Analyst “we want to educate others on the possibilities of data science through meaningful insights.” Another benefit is that ADI findings are syndicated broadly, thereby extending Adobe’s market reach which contributes to a significant increase in awareness of Adobe’s “big data” expertise. For example, Adobe got great exposure with over 7,000 press stories including Good Morning America, Today Show, CNBC Squawk Box and much more by identifying the average daily discounts for toys and electronics this past holiday season. Digitization for the sake of digitization is not the way to go. Deep attention needs to be given to what digitization of what knowledge should be undertaken and why. Whether the strategic intent of digital transformation is to meet customers’ expectations, to innovate, or to enable efficiencies, organizations increasingly are recognizing that they need to transform their businesses in order to participate in the new digital world order or risk becoming irrelevant. But digitization for the sake of digitization is not the way to go. Deep attention needs to be given to what digitization of what knowledge should be undertaken and why. This is determined by mapping your major knowledge assets and then thinking through what the benefits are of strategically structuring and diffusing such major assets across the map. The Adobe examples set forth above illustrate three powerful strategic outcomes from such moves: to succeed in an adjacent market by mobilizing tacit knowledge gained through acquisition; to build critical customer credibility by diffusing tacit knowledge to and with customers; to hugely extend customer awareness and add value through codification and aggressive diffusion of proprietary knowledge. These three strategies are illustrative, but far from exhaustive. Every mapping of knowledge assets will present its own set of context-specific digitization opportunities. Leading your firm in this new digital reality requires a thorough understanding of all of your critical knowledge assets, both explicit and tacit. Equipped with a strategic knowledge map, corporate leaders can craft a competitive strategy and make digital transformation a reality. In the corporate world, businesses are regularly graded on the value of their assets. But when it comes to measuring their knowledge assets, value can be harder to gauge. Digital transformation is everywhere and is impacting all businesses, independent of size, location, or industry, resulting in new business models and reinvention of entire strategies. With new technologies such as Big Data, cloud, mobile, social, the Internet of Things, machine learning, and business networks, businesses can take advantage of new opportunities. However, they also need the skills available to recognize the potential within the context of their industries and to capitalize on that potential. It is up to each individual business to identify opportunities and decide on the best strategy toward growth and margin improvements by focusing on technology-driven, customer-centric innovation. This can be through products and services, redefinition of their engagement with customers and suppliers, and an engaged, high-performance workforce. In order to do this successfully and beat the competition, both management and employees need to understand the power of digital technologies and the new solution paradigms they offer to define a digital vision and execution plan to get there. A recent study1 carried out by Technical University of Munich (TUM) revealed a skills gap that may become a major barrier: 83% of respondents state their companies are lacking the skills necessary for digital transformation; 73% state that their business executives do not have the technology skills required.